$15 per daytime hour (4-hour minimum), offering light housework, cooking your favorite meals, childcare, breastfeeding support and more. Contact me today to schedule a free no-obligation consultation. The sooner you have me on your team, the more benefit we have from being able to prepare for birth together. It is also important to reserve my services as early on as possible so that you know for sure if I will be available when you are due and not already booked for another birth. It's the same investment early in pregnancy as it is last minute, with added value of more support. 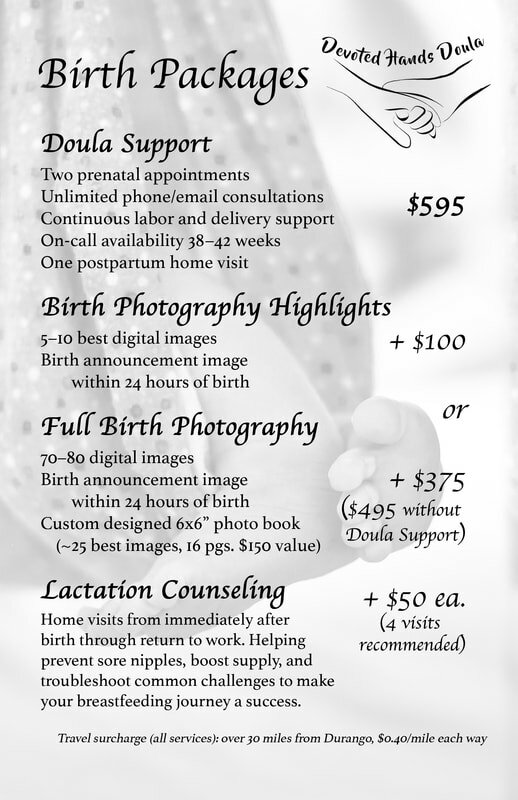 Please note, if you are experiencing a crisis pregnancy and cannot afford full doula services, don't hesitate to reach out anyway to see if we can work with you to make it happen. You deserve support! There are many resources I can connect you with in this county as well.